Dietmar Ippu Herriger (shakuhachi, alt-saxofon, bass flute and bass clarinet) dedicated his life to the studies of wind instruments in Europe and Japan. 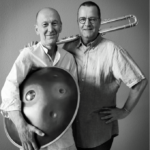 He is currently teaching flute, saxophone, clarinet, and shakuhachi play at Leo Kestenberg Music School in Berlin. Tivadar Nemesi is a percussionist, based in Budapest and Berlin. He plays the legendary Swiss percussion instrument Hang Drum. Tivadar studied photography at Budapest Academy and is an author of many musical and art projects. He also creates film music. They dedicated their residency to their mutual project MA: In between, Today. The outcome was a concert in an artistic club Zázemí in Bartolomějská street, Prague. 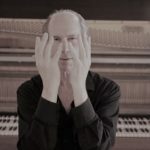 Multi-instrumentalist and a jazz experimentator Steve Cohn, together with Marek Kimei Matvija and Annabelle Plum, recorded and presented new compositions for shakuhachi, experimental voice and quarter-tone piano.